Neocallitropsis pancheri, as described in 1977 by David John de Laubenfels (1925-2016), in Flore de la Nouvelle Calédonie et Dépendances, vol. 4 is commonly known as Chandelier cypress. It is the sole species of this genus. 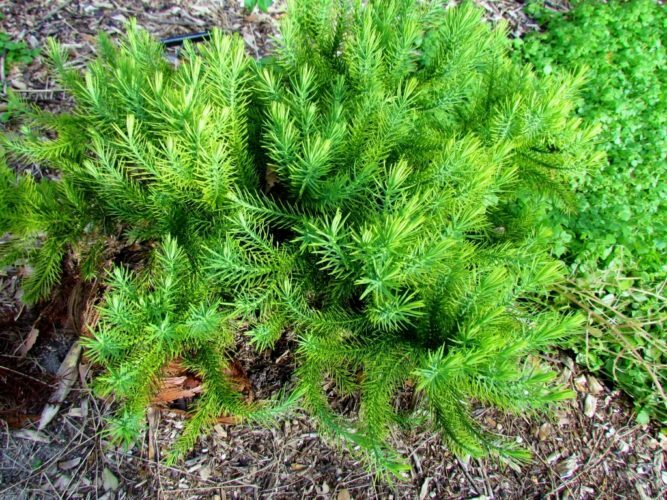 Its genus name is derived from its resemblance to Callitris. The species name honors French gardener and botanist Jean Armand Isidore Pancher (1814–1877), who served government botanist in Nouméa, New Caledonia, from 1857 to 1869. Description. Chandelier cypress is an evergreen coniferous species of tree which will grow to mature heights of 6 to 30 feet (2 – 10 m) tall. Bark is more or less smooth with long furrows, exfoliating in thin, fibrous bands, brown to dark brown in color, changing to gray with age. Wood has a strong odor of camphor. Seed cones are 0.6 to 0.8 inch (1.5 – 2.0 cm) long, with eight woody scales arranged in two whorls of four. Distribution. 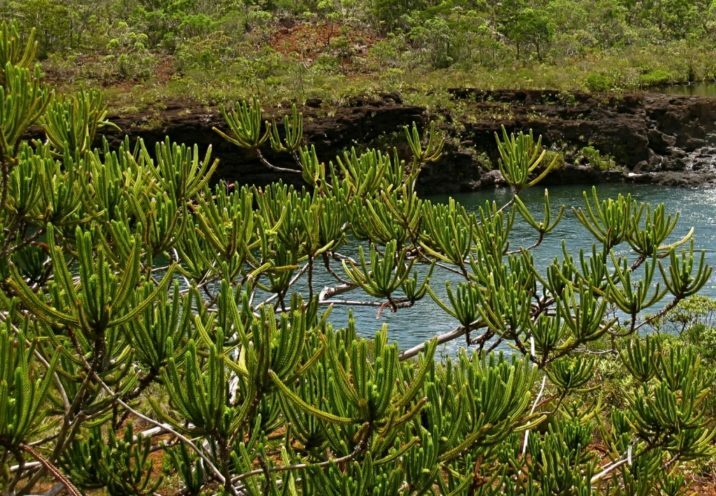 This species is native to New Caledonia, where it is only found in small, scattered populations along the many rivers, especially in the southern part of the main island and along the ridges of Pic Buse on the southern flanks of Mt. des Sources at lower elevations and up to 3,000 feet (950 m) above sea level. It grows in the middle maquis on serpentine soils. 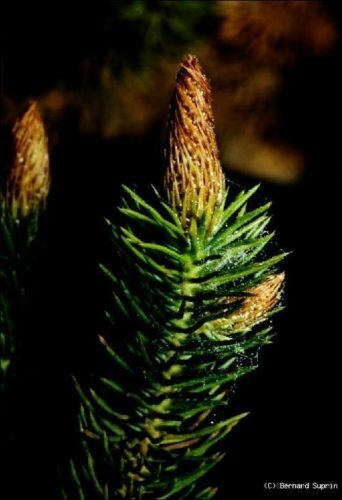 The pedomorphic form is comparable to that of Dacrydium guillauminii with which it is often associated; it is an adaptation to serpentine. 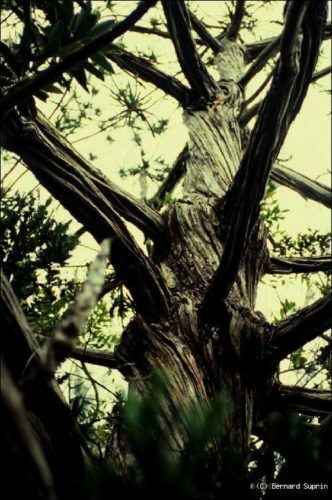 The candelabra form is also characteristic of trees growing in serpentine soils, like Callitris neocaledonica, another allied species. Hardy to USDA Zone 10, cold hardiness limit between 30º and 40ºF (-1° and +4.4°C). Neocallitropsis pancheri at Montgomery Botanical Center, Coral Gables, Florida. Neocallitropsis pancheri growing in nature at Chute de la Madeleine, New Caledonia. Neocallitropsis pancheri — a closeup of pollen cones.